Businesses frequently enter into contracts, whether it is with employees, other businesses, or customers. It is easy to think that the power to contract gives a business the ability to set whatever terms it prefers for an interaction, so long as the other party agrees. However, state law puts some limits on the power of contracting. It is important to consult with an experienced business law attorney before adding new language to the contracts you use to be sure the terms will be enforceable down the road. One example of the laws you need to be aware of when drafting contracts has to do with non-disparagement clauses. You Cannot Use Non-Disparagement Clauses in Consumer Contracts. A non-disparagement clause can be extremely appealing to a small business owner. In this day and age, where potential customers rely heavily on online reviewing services, like Yelp, when making decisions about who to do business with, an unfair and unflattering review can sink a small business. To counter this problem, some businesses began including clauses in their contracts with consumers prohibiting the consumer from making negative statements about the company. However, California has now banned these clauses. Los Angeles Mayor Eric Garcetti proposed this week that the city raise the minimum wage to $13.25 by 2017. The current minimum wage in Los Angeles is $9.00 per hour. This is the minimum wage for all of California, but some cities throughout the state have enacted even higher minimum wages. For example, San Diego has approved a minimum wage of $11.50, and San Francisco voters will decide later this year whether they want to increase that city’s minimum wage to $15 per hour. This potential wage increase of nearly fifty percent in Los Angeles carries with it serious pros and cons that have to be considered both by anyone planning on creating a new business in Los Angeles, or anyone considering expanding a business to Los Angeles. How Would the Minimum Wage Increase Work? According to USA Today, the proposed increase would make the minimum wage in Los Angeles one of the highest in the nation. Of course, the mayor cannot act unilaterally, and will need the approval of the City Council to make the increase law. As the proposal stands now, the increased would be gradually phased in. In 2015 it would jump to $10.25, then in 2016 it would increase to $11.75, and finally in 2017 it would increase to $13.75. Then, in the future, additional increases would be tied to the Consumer Price Index for urban wage earners. Last week, PandoDaily reported that Gawker has begun filing documents in response to the lawsuit, many of which paint the company in a very hypocritical light. In several affidavits, Gawker employees, including managing editors, avert that the interns were rewarded with valuable experience that was all part of an informal training process: “Simply observing what it is like to work at a place like Gawker is valuable, and internships at Gawker sites are good for a person’s resume.” The hypocrisy: Last August, Gawker castigated Facebook COO Sheryl Sandberg for having one of her employees advertise for an unpaid assistant to help Sandberg on her book tour. The case against Gawker was filed shortly after a federal judge ruled in favor of plaintiffs in a class-action lawsuit filed against Fox Searchlight Pictures in federal court in New York. In that case, two former interns who worked on the film “Black Swan,” claimed that Fox violated federal and state minimum wage and overtime laws. The plaintiffs alleged that they had the duties and responsibilities of regular employees, but did not receive adequate training and supervision, as required by the FSLA (an employer using unpaid interns must provide training and gain “no immediate advantage” from the interns, such as displacing a regular employee by performing his/her duties). Tagged: "california employment law attorney", "California employment law lawyer" and "California small business attorney"
Last week, we discussed several alleged criminal situations involving drivers for California ride-sharing companies, Uber and Lyft, and how the misclassification of workers as independent contractors when they really perform as employees can result in significant legal trouble for your startup or small business. As promised, this week we will discuss what your startup or small business should know about screening applicants and current employees. 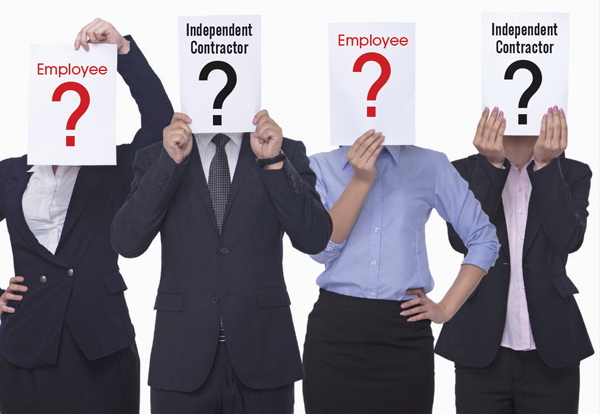 This is important because, just as the misclassification of workers can result in headaches for your business, so too can bad hiring decisions. As mentioned in last week’s article, one of the Uber drivers who allegedly assaulted a passenger was a convicted felon, but that information never came up during a background search. Negligent hiring lawsuits are on the rise. If an employee’s actions hurt another, the employer may be liable. Bad hiring decisions can also result in internal issues such as embezzlement or workplace violence against other employees. Thus, it is important for startups and small businesses to be cautious, and background checks are one way to gain some peace of mind. Background checks vary widely in quality, scope, and validity. The Federal Fair Credit Reporting Act (FCRA) sets the national standard for employment background checks. A background check under the FCRA is referred to as “investigative consumer report” and it is limited to personal interviews with friend, neighbors, and business associates. The FCRA applies only to background checks performed by outside companies. If you are a California employer, you are also governed by the Investigative Consumer Reporting Agencies Act (ICRAA), which is broader in scope than the FCRA, as it covers third-party employment screeners as well as employers conducting internal or in-house screenings. Under the ICRAA, the appropriate term for a background check is an “investigative consumer report.” An investigative consumer report includes information about a person’s character, general reputation, and personal characteristics, but does not include credit report information; in California, credit report information can only be requested for certain positions. California employers can delve into an applicant’s criminal history, but may only report criminal convictions dating back seven years, unless another law requires the employer to look further into an applicant’s background. This will depend upon the position. Pursuant to the ICRAA, California employers must provide notice to individuals undergoing background checks, and the individuals must provide authorization before the employer conducts a screening. California employers must also provide to screened applicants copies of any public records gathered in the process of a background check. Note that the notice requirement under the ICRAA is greater than that required by the FCRA. Additionally, note that last March, a California court found the ICRAA unconstitutionally vague. An appeal of that case is pending, which could alter employer duties/requirements. We will update if necessary. Tagged: "California business law attorneys", "California employment law attorneys" and "California employment law lawyers"
With so many items on the “to do” list, new employees at start ups are often immediately thrown into the fire. Everything seems to move at a quicker pace for new companies, and it is common for employees to simply learn as they go and for problems to be ironed out as they arise. It is natural for new workers at these companies to operate differently than those in large, established companies. However, there may be some basic protocols that even brand new companies should take from their established rivals, like decent employee training. The cost in money and time at the outset often proves to be a lifesaver for new businesses down the road. One of the most high-profile California stories this month involved lawsuits filed against San Diego Mayor Bob Filner. As many know, several female staff members recently came forward, claiming that the Mayor engaged in egregious conduct and sxual harassment. The case took on unique legal arguments when Filner’s own attorney argued in a letter to the San Diego attorney, that the city lawyer should defend the suit with public funds, because the city failed to provide the Mayor with sexual harassment training. Tagged: "sacramento business attorney", "sacramento business employment lawyer" and "sacramento start up lawyer"